You are here: Home / Everything / The Biggest, Clunkiest iPad Mini Case Ever: My Old Mac SE! What happens when you mix two old, broken things together? In the case of my Mac SE and iPad mini, the result was pretty cool! Meet my desktop videoconferencing system! I spend a lot of time on conference calls, often using one of the too-plentiful slide and video sharing applications. I’ve found that the iPad version of these apps is typically more stable, quicker to start, and more up to date than the Mac or PC version. Frankly, I hate installing the browser plugins and so on required to get these applications to function, and the iOS version just works! I could just sit an iPad on my desk. But where’s the fun in that? If something is going to sit on my desk, it should match the retro tech style! 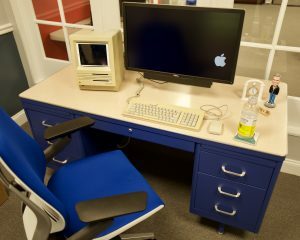 Is that a Mac SE on my desk? Why, yes it is! Way back in 1992, I picked up a broken Mac SE from a guy on Usenet. I was an avid Atari ST user at the time, but I couldn’t resist the draw of free tech! Alas, the CRT tube was bad and I never got around to fixing it. Now here I am 25 years later and that Mac SE is still sitting in my basement, waiting to be put to use. I considered making a “Macquarium” but the fish visibility factor would be quite low with that little 9-inch screen. But that got me thinking: Would an iPad fit in that space? 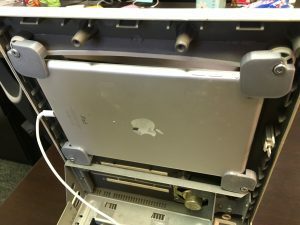 Although the screen of a full-sized iPad might fit in the CRT opening, the borders would be cut off. And there would be no way to access the home button or camera. But an iPad mini would fit perfectly! Happily, I had just such an iPad sitting in my desk: My daughter broke the screen on hers and saved up to buy a replacement. Even with a broken screen, the Mini still works fine. Perfect! I removed the CRT, analog board, power supply, and logic board of the Mac and tried it for fit. Perfect! Held in landscape orientation, the iPad mini is almost exactly the right size horizontally, if a bit narrow vertically. Although the outer buttons and switches are unreachable, there are soft controls that take their place. I sat down with Tinkercad and designed a special “grommet” to hold the iPad in place. I designed it so it could be used at any of the four corners of the iPad, attaching to the original CRT mounding holes with the original Torx screws. It’s a tight fit for the power cord, but everything lines up nicely. This was a pretty satisfying project. The iPad is extremely useful for conference calling, FaceTime, and so on. And it’s cool to be able to recycle some old, unused electronics into a useful desk accessory. 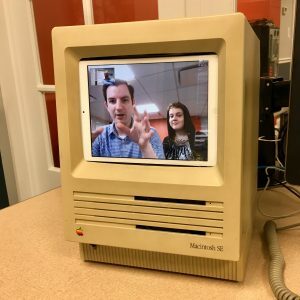 If you’ve got an old 9-inch Compact Mac, an iPad mini, and access to a 3D printer, you can do the same! Just download my Macintosh iPad mini Grommet from Thingiverse and print four of them!